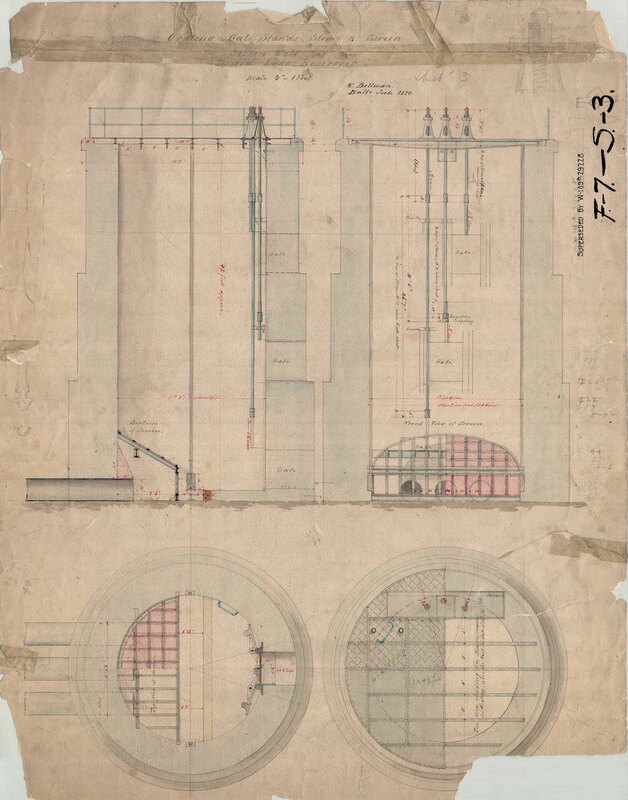 Although the writing on this drawing is hard to read, from what I could read it states: 1869, Cross section through [pipes?]. Effluent and Influent [?] Lake Chapman ^ Druid Lake December 2[?] 1869[?] What I like about this is that it is the first drawing that I have seen where Druid Lake was called Lake Chapman. 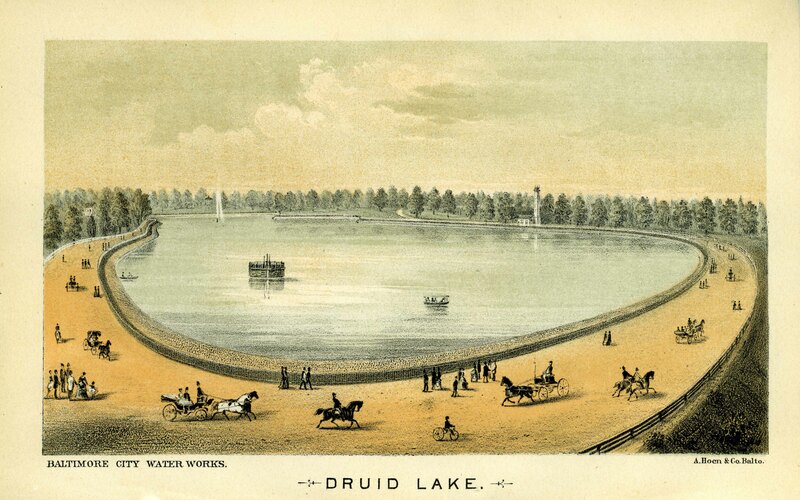 1867 Druid Lake (Lake Chapman): Completed Lake Chapman, 429,000,000 gallons, capable of holding a supply of water equal to 40 days of consumption. Lake has nominally the same elevation as Hampden Reservoir, but is usually about 5 feet lower. 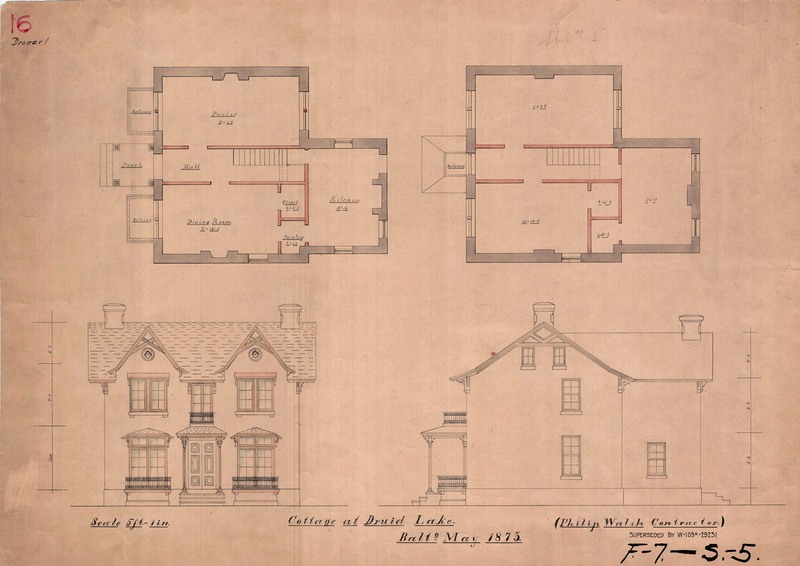 1868 Druid Lake (Lake Chapman): March 30, Res. No. 111, changed name of Lake Chapman to Druid Lake. Another hard to decipher drawing: W. Bollman(?). Balto. Jule(?) 1870. Grating, Gate Stands, Stems and Screen for screen well at Druid Lake Reservoir. 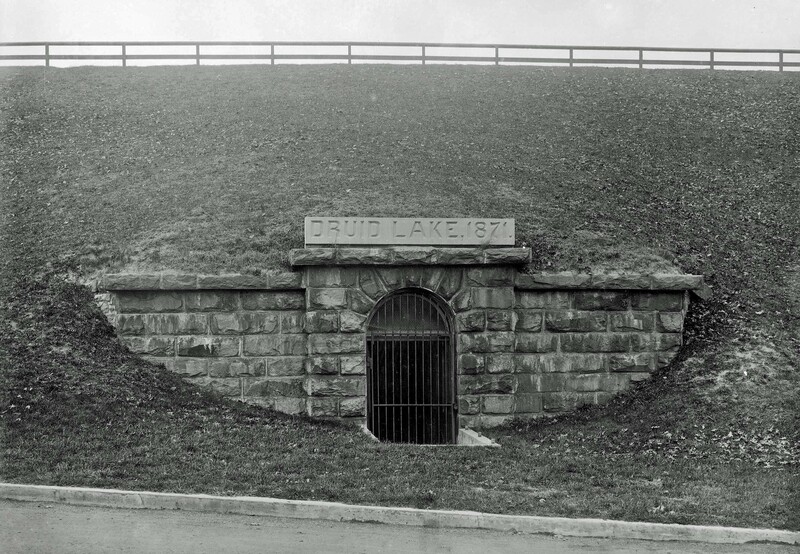 1870 Druid Lake: The inside portion of the Druid Lake dam was completed in 1868 except for the remaining top 30 feet of the required elevation, and had remained unfinished during the year 1869. 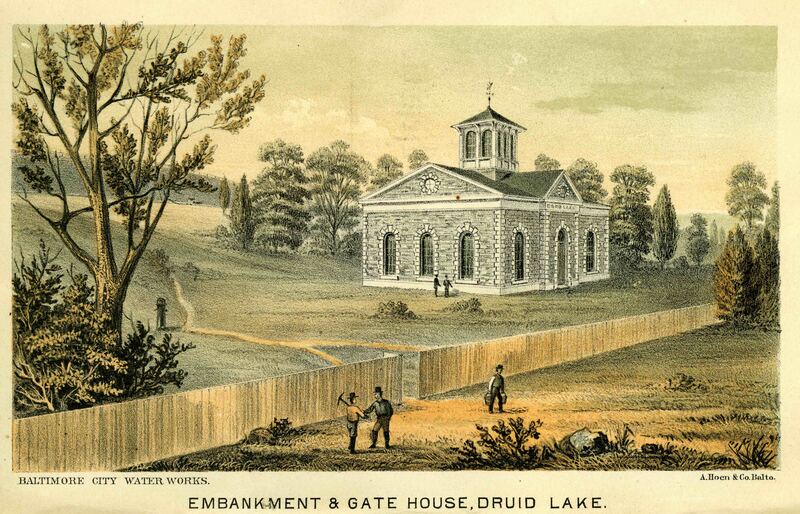 Work on Druid Lake resumed on May 2, 1870. The Druid Lake Park Reservoir is completed and water is first let. Druid Lake has a storage capacity of 493 million gallons, but only 429 million gallons to be available for City use. This equates to 40 days of water consumption which would allow ample time for Lake Roland to settle after the heaviest rains. The extreme water depth at the foot of the dam is to be 65 feet. The extreme water depth at the upper end of the dam is to be 20 feet. Druid, Mt. 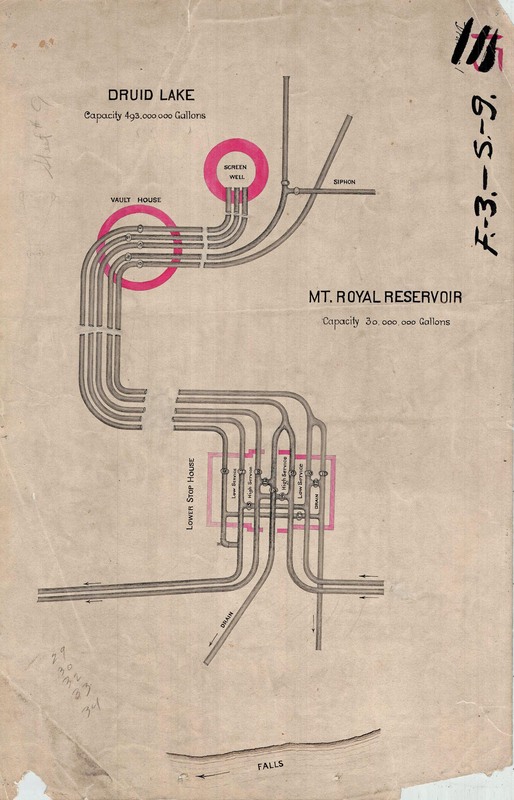 royal and Hampden Reservoir were all connected through various series of pipes. 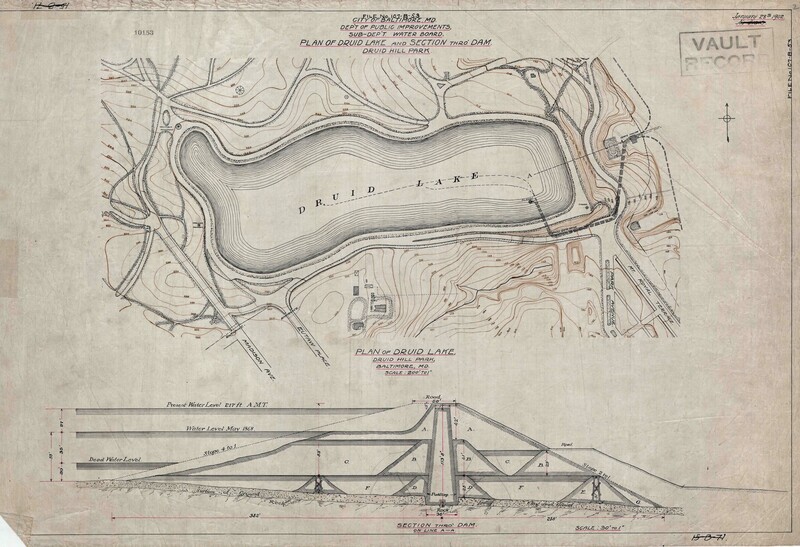 In 1898 (for year ending 1897) it is reported that the water conduit from Lake Roland to Hampden Reservoir is a brick conduit, and the water is then delivered from Hampden Reservoir to Druid Lake by means of four 30-inch cast-iron pipes. Photo of valve vault at embankment. 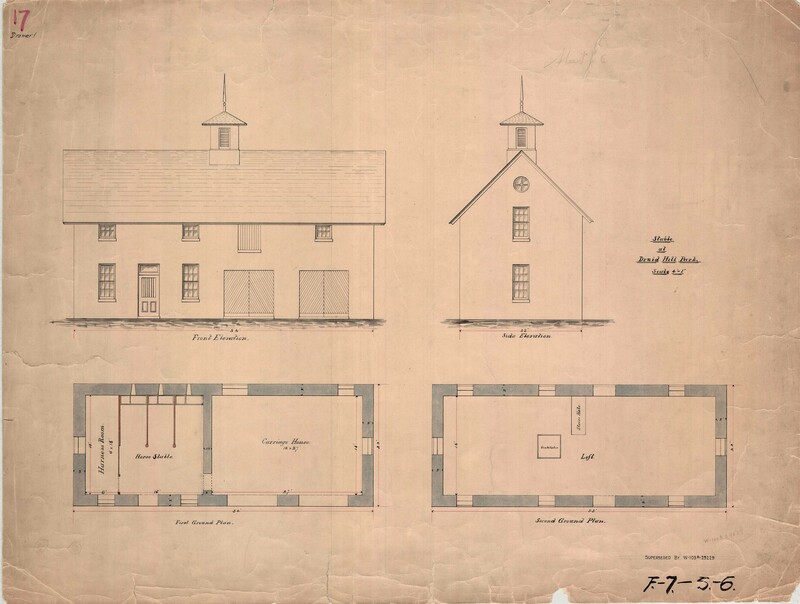 From the Water Engineer’s report to the Mayor – Hoen lithograph. Another drawing of the lake. Looking close to the upper left I believe that was the keeper’s cottage. To the right is the High Service Reservoir Pump Station. The cottage at Druid. 1873. Philip Walsh, contractor. The stable for the cottage. Not sure of this drawing from 1902. It is saying that the lake is 118′ deep?? An earlier report puts it at 65′. 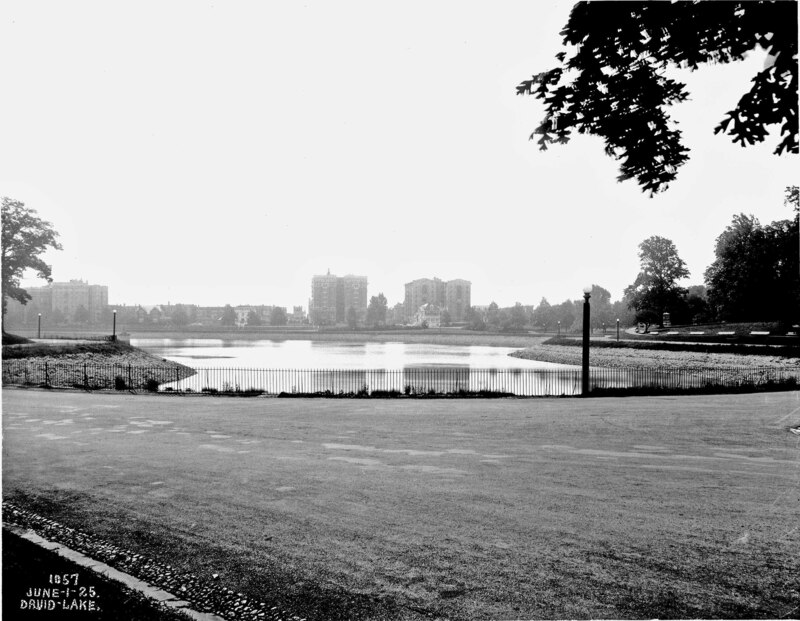 Looking across Druid Lake in 1925.